We’d love your help. Let us know what’s wrong with this preview of Break Me Not by Kristie Cook. A continuation of Forget You Not and Lose You Not, this is Addie and Tase’s story. Addie Beaumont loves her hometown of Havenwood Falls and would do anything to protect it. She also loves Tase Roca—even after all the times he’s broken her heart. She would do anything to protect him, as well, so when her two loves are on the brink of destroying each other, Addie gets caught in the middle. A curse is transforming Tase from a mortal vampire into an unstoppable, bloodthirsty monster. He’s become a lethal threat to Havenwood Falls, causing the town’s leaders to hang a death sentence over his head. It’s up to Addie to break the curse before they execute him. The Eye of Valerian holds the answers, but the dark artifact is protected by black magic that scares the hell out of her. When she finally unlocks its powers, she and Tase are swept into a dangerous plot that could destroy everything they cherish. Love may be their only hope, but true love means no secrets, and they both keep plenty. One Addie denies even to herself, but embracing its truth has the potential to save her town, her loved ones, and Tase—and the power to break them both. This is a New Adult paranormal romance in the world of Havenwood Falls, a collaborative series in the fantasy genre featuring a variety of supernatural creatures. Each author writes a stand-alone story, so they can be read in any order. To ask other readers questions about Break Me Not, please sign up. Kristie Cook's third installment to her own piece of Havenwood Falls definitely doesn't disappoint!!!! 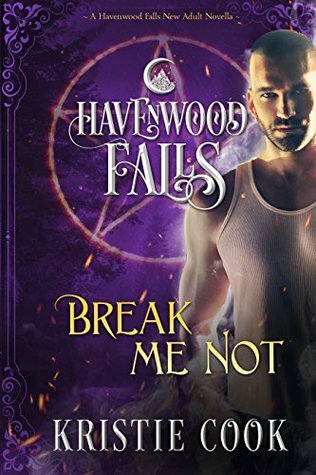 Break Me Not is a Havenwood Falls Novella by Kristie Cook. I have to admit that I wasn't sure about several authors writing with a cohesive vision of a complex and diverse setting like this series, but I'm blown away with each installment. Each novella is stand alone and builds one every other story and characters. With each novella, I can't wait to read more and find out more of the hidden secr Kristie Cook's third installment to her own piece of Havenwood Falls definitely doesn't disappoint!!!! With Addie Beaumont there are two things she would risk her live for…Havenwood Falls and Tase Roca. She fell in love with Tase years ago…and even after he broke her heart…she can’t stop loving and fighting for him. In the previous book we learn Tase has a curse placed on him and only Addie has the power to figure out how to lift it. Because this curse puts everyone in Havenwood Falls in danger, the supernatural court steps in to decide Tase’s fate. Addie must use the Eye of Valerian and all its b With Addie Beaumont there are two things she would risk her live for…Havenwood Falls and Tase Roca. She fell in love with Tase years ago…and even after he broke her heart…she can’t stop loving and fighting for him. In the previous book we learn Tase has a curse placed on him and only Addie has the power to figure out how to lift it. Because this curse puts everyone in Havenwood Falls in danger, the supernatural court steps in to decide Tase’s fate. Addie must use the Eye of Valerian and all its black magic to find out all the past secrets and hopefully find the cure for Tase…and her heart. This story was very entertaining and fast read. Can’t wait for the next authors set of characters. As part of Ang'dora Productions Review Crew I was able to read Kristie Cook’s Break Me Not as an advance review copy. The continuation of Forget You Not and Lose You Not, this is Addie and Tase’s story. If you had the power to save everything you loved, even though it meant embracing the one thing you had always denied, would you? I confess that I didn’t enjoy this book as much as I thought I would have done, but that probably could have been remedied by re-reading ‘Forget’ and ‘Lose’ before embar As part of Ang'dora Productions Review Crew I was able to read Kristie Cook’s Break Me Not as an advance review copy. It is astonishing to me that an author can deliver a story with such depth and complexity, in such a short number of kindle pages. Of course, I am aware that a lot of the world building has been done, especially around these two, given their roles within the community. That does not, to my mind, detract from the apparent ease at which this story is woven. I love the characters; I love the inexorable feeling of the plot arc; I love the underlying message. In short - I love this book. I voluntarily It is astonishing to me that an author can deliver a story with such depth and complexity, in such a short number of kindle pages. Of course, I am aware that a lot of the world building has been done, especially around these two, given their roles within the community. That does not, to my mind, detract from the apparent ease at which this story is woven. I've waited for this story since Forget You Not and Lose You Not. I needed to know Tase & Addie would find there way to each other, and Tase would be cured. What I learned...you'll have to read Break Me Not for yourself. Another great read to the Havenwood Falls family. I received this ARC for an honest review. I can't begin to tell you! I have been waiting for this story and I fell in love. Addie's story was fantastic, I loved the twist and turns with Tase. And to see how some of these stories are linking with the over ARC of the collector has been great considering how many authors are adding their stories. I would definitely recommend this and the entire series. When you get lost in a world of make believe, a fictional town, you want to live there forever. I had been waiting for more books to come from this lovely town, and this author didn’t disappoint at all. Another installment, another book that leaves you needing more answers! Get this book now. I love this little town. Wow what a ride! I love this series, but this book just blew me away. I have loved Addie since I first read about her, and wanted more and that is just what we got. I laughed, cried and was totally shocked. Goodness I can't wait to see what happens next in this town!! A day is too long to wait for the continuation of this story!!! Advance readers copy. This is a amazing read. I loved reading Addie and Tase’s story. The pace was perfect in every way and the way the plot is set is really great. Kristie Cook knows how to spin a story and being in Havenwood falls is a true treasure. Addie learns a lot about herself she didn’t know all the while doing what she needed to do to help Tase. The chemistry between the two is really emotionally intense. Damn! Didn't see that coming. Excellent! I tell you what, this book reminds us Havenwood is all avout secrets and lies and this one takes you into the depths of them all. This book had me laughing and doing some crying. For a moment or two I was even considering not speaking to the author for a few moments. But what good is a story if you don't threaten the author once or twice. Excellent book and I love how it ties more and more of the characters to each other and this town. Wow, I thought my sma Damn! Didn't see that coming. Excellent! Excellent book and I love how it ties more and more of the characters to each other and this town. Wow, I thought my small town could be full of drama. Love it. This is another great story in the Havenwood Falls series. The twists turns, insecurities and emotions in this story are excellent. I loved how the relationship between Addie and Tase developed, it had just the right amounts of angst and tenderness. I also enjoy the various links with characters from other Havenwood stories and how the mystery of the collector runs through varies books. This is a great story in a very enjoyable series.